What do you see when you look at the image to the right?  Scholar and preacher, George Buttrick (1892-1980), used this example once to illustrate God’s “widespread mercy” that overcomes the “black dot.” We all have “dots” in our lives. Calling them “dots” doesn’t reduce the incredible pain and challenge to our lives that can be inside of them. But in the midst of them, it helps to zoom out and see the surrounding, bigger picture of how God is at work in your story. Over the last few weeks I’ve been co-leading a series on Sunday mornings with my good friend Mike Cagle called The Good and Beautiful God based upon an excellent book by James Bryan Smith. This past week we have been focusing on truly believing that God is trustworthy. Our spiritual exercise for this week is to write down things for which we are thankful. When we focus on our blessings we are reminded of God’s “vast treasure” (as Buttrick put it), even in the midst of pain, difficulties, and suffering. Let’s focus this week on those vast treasures and focus on the things in life that God has given us that are beautiful and wonderful. Try to think of even the simplest things in life that we often take for granted. I’m guessing that as we do this, we will begin to see just how vastly blessed we truly are. And hopefully…the dots, no matter how painful or how difficult, will begin to be put into perspective in the larger, beautiful story of God at work in our lives. Whether you are a part of this class or not, I would love for you to make a list of your “vast treasures” to share with our online community. You can do this by simply clicking the COMMENT button to the left and typing your list in the REPLY box. I look forward to sharing and focusing on the blessings that come from our truly beautiful, good, and trustworthy God!